The V Foundation for Cancer Research, a top-rated cancer research charity, is excited to announce details regarding the 12th annual V Week for Cancer Research, November 27 thru December 8 across all ESPN platforms, with additional programming and highlights continuing throughout the month. V Week will encourage supporters to donate to the V Foundation through the theme “Cancer Is,” while sharing stories of patients, researchers and care-givers. V Week launches today – November 27, on Giving Tuesday. Tomorrow evening, November 28, at 7:00 p.m., ESPN will dedicate all of its platforms to sharing inspirational messages from the late Jim Valvano and others, including Robin Roberts and the late Stuart Scott and Craig Sager. 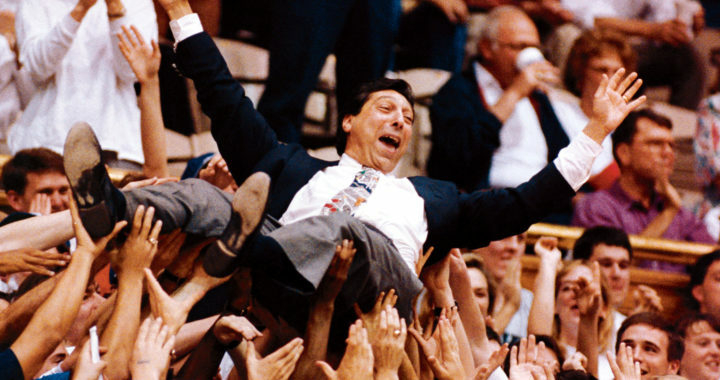 Included in V Week is the 24th annual Jimmy V Men’s Basketball Classic. The men’s college basketball doubleheader returns to Madison Square Garden in New York City on December 4, and it will feature an opening game between Notre Dame and Oklahoma, followed by a primetime showdown between Florida and West Virginia. Notre Dame will host UConn in the women’s event on December 2 at the Purcell Pavilion. WeRateDogs “h*ck cancer” campaign (November 27-December 8): Sports fans love their dogs, and the V Foundation will harness that passion by teaming up with WeRateDogs. The campaign will drive awareness of the V Foundation’s canine comparative oncology initiative and highlight dogs who are currently fighting cancer. WeRateDogs has created customer merchandise with the slogan “h*ck cancer” and will donate 100% of net proceeds from these sales to the V Foundation. Craig Sager Style Day(November 29 and 30): Celebrates Sager’s love of life. NBA Players, ESPN and Turner talent will wear colorful jackets and clothing to capture his signature “Sager Style.” Jackets, including two of Sager’s, will be auctioned off on ebay.com/espn through December 6. Working with Stacy Sager, the V Foundation will name a leukemia grant in honor of Craig. Kicks to Beat Cancer(through December 6): Athletes, celebrities and ESPN talent are auctioning off their sneakers to benefit cancer research. Fans can bid on the shoes at ebay.com/espn. Constellation Brands Beer Division has been a proud supporter of the V Foundation since 2010. In 2018, Corona and its Gold Network Distributor Partners’ national “Hoops for Hope” campaign raised critical funding to support the V Foundation. During the month of September, employees from Bristol-Myers Squibb embarked on an epic three-week journey, cycling across America to raise funds for the V Foundation. WWE and the V Foundation have partnered to raise funds for pediatric cancer patients through Connor’s Cure, a national Pediatric Cancer Month fundraising campaign. WWE’s integrated support includes fundraising and awareness generating activities to support the V Foundation. Hooters supports the V Foundation through their “Give a Hoot” Each October, Hooters raises funds during Breast Cancer Awareness Month through multiple fundraising initiatives at locations throughout the U.S. The New York Road Runners is committed to change the world for the better through running and fitness. Through the 2018 TCS New York City Marathon, the V Foundation’s team, Team V, raised essential dollars for the V Foundation. The V Foundation has proudly awarded more than $225 million for cutting-edge cancer research. The V Foundation holds a 4-star (highest) rating from Charity Navigator, America’s largest evaluator of charities, and is among the top 4% of all charities evaluated. The V Foundation is a GuideStar platinum-rated charity.